China Faces International Criticism at Nobel Ceremony in Oslo and Climate Talks in Cancún | Democracy Now! of the China-based organization Innovation Center for Energy and Transportation. She often writes about China and U.S.-China relations and has an article appearing in an upcoming issue of The Nation. AMY GOODMAN: Joining us here in Cancún, Mexico is Lucia Green-Weiskel. She works at the Beijing-based organization Innovation Center for Energy and Transportation and often writes about China and U.S.-China relations. She has an article appearing in the upcoming Nation magazine about why the U.S. and China don’t agree on a climate deal. We’ll get to that in a minute, but as we speak, the Nobel award ceremony is happening in Oslo. Liu Xiaobo is not there. There is an empty seat symbolizing the fact that he is in prison in China, his wife under house arrest. Talk about the significance of this award and who Dr. Liu Xiaobo is. LUCIA GREEN-WEISKEL: Well, thank you, Amy. It’s great to be here. And I am not a human rights activist; I’m an environmentalist, as you rightly identified me. But I do know Liu Xiaobo is a professor, he’s a human rights activist, and he’s has been in jail since December of 2008, actually his third time in jail, this time for his participation in Charter 08, which, as you said, is a petition calling for human rights and democracy in China. It was signed by over 300 Chinese intellectuals and published in the 60th anniversary of the U.N. Declaration of Human Rights. Liu Xiaobo — the Chinese have had a problem with Liu Xiaobo because he’s a bit of an anachronism. He represents a type of democracy that doesn’t really exist in China today. Also, many people — many Chinese citizens believe that the award for Liu Xiaobo was basically an effort to humiliate China and, in the end, has counterproductive results rather than moving towards peace between the United States and China or within China itself. The reason is that China does not respond very well. The Chinese government does not respond very well to this sort of public shaming. An example is two years ago. I was actually in Shanghai at the time. The famous musician Björk gave a concert, and she played a song called “Liberation,” or something about liberation. At the end of the song, she whispered, “Tibet, Tibet.” And this event was published on YouTube. There’s many people who had cameras in the audience. The following day, YouTube was shut down in China. And this is an example of how, when there’s pressure on the Chinese government, the people who actually suffer the results are actually the Chinese citizens, young people who use YouTube as a life line to find out about cultural events, about political events, and a way of staying connected to the rest of the world. 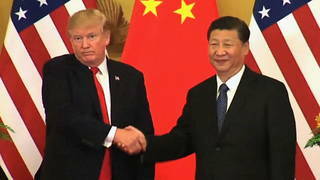 So, I think this maybe was a counterproductive event, you know, for China and not necessarily one that would bring peace between the United States and China. AMY GOODMAN: Well, of course, the Nobel Committee is not particularly concerned about whether it will bring peace between the United States and China. But could you talk about who he is and his return — he grew up in China, was educated in China, but then went outside, as well, to be educated. LUCIA GREEN-WEISKEL: Yeah, he has a BA and a MA and a PhD all from Chinese universities. He was born in 1955. His parents were intellectuals. And he grew up in a time that was very tough in China. He lived through the — both the Great Leap Forward in the ’50s and then the Cultural Revolution in the ’60s. Both of those events were extremely hostile towards intellectuals, to the point of many intellectuals even being killed at that time and sent out to the countryside to do manual labor. So he has a very particular experience of history that I think has informed his view of China and of human rights and of democracy itself. But now China has changed. And as I started saying before, many of my friends, or the people that I work with in China, are quick to point out that democracy in the way Liu Xiaobo represents is “big D” Democracy, American democracy. And in fact, Liu Xiaobo is funded by the Endowment for Democracy in Washington. Now China — many Chinese citizens are very quick to point out China’s own history of nonintervention, the fact that China is one of the only countries in the world that’s never colonized another country in the way that America and European countries have colonized countries, that also China has lifted 30 million people out of poverty. That’s half of the people who have been lifted out of poverty since World War II have happened in China. So I think the Chinese people, or the young people that I’ve spent time with in China, feel a sense of pride that China has a peaceful rise, and they feel misrepresented by the media in the United States that wants to see China as a suppressive government. There’s no question that there are human rights violations in China, but there’s also lots of freedoms. And one thing I just want to add is, an example of those freedoms is actually happening right here in Cancún, where a record number of NGOs, non-governmental organizations, from China are participating in the talks. For the first time — this is civil society — China’s civil society is actually having a voice and being ushered in by the government, being welcomed by the government, to take part and participate in the negotiations here. AMY GOODMAN: It was very interesting. Yesterday, my colleague Mike Burke, producer here at Democracy Now!, went out to speak with Chinese representatives here, people who are engaged in the climate talks, about the Nobel Peace Prize. There’s not one who would stop and talk to them. Clearly, whether it’s afraid or not, it’s not a reaction we get normally when we’re talking to people here — absolute total silence. But talk about Liu Xiaobo and why he’s in prison, his return to China at the time of Tiananmen, trying to stop the killings. LUCIA GREEN-WEISKEL: Yeah. Well, actually, he returned to China, as far as I know — and again, I don’t have a background in human rights, but I did follow this just sort of as a citizen who was interested. But he returned to China during — he was at Columbia University in the United States at the time, and he heard about the democracy movements that were happening leading up to the protest in Tiananmen Square in June of 1989. Actually, the year before that, there were a lot of protests that took place in very different — in all over China. So Tiananmen was just one of many protests. And his role, as I’ve heard, was to actually take students out of Tiananmen Square and try to save them from the mass slaughter that he saw was going to happen. AMY GOODMAN: In fact, he dedicated the Nobel Prize today to those lost souls. AMY GOODMAN: Why is he in prison? LUCIA GREEN-WEISKEL: He’s in prison for inciting subversion to state power. I mean, that’s the — I don’t know exactly what the Chinese government — you know, there’s very little transparency on these issues. AMY GOODMAN: And his wife under house arrest, that she can’t even come. LUCIA GREEN-WEISKEL: Yeah, that’s right. I mean, this seems to be a disproportionate response on the part of the Chinese government. And I think that he should definitely be freed, as should his wife. AMY GOODMAN: Now, the repercussions of this at the climate talks in Cancún, the Chinese won’t speak to the Norwegians. Talk about what is happening here in Cancún and also the role of Japan. Japan — countries are staging an all-out, not violent, but assault on, because it’s saying it will not renew the Kyoto Protocols, which of course were hammered out in Kyoto, Japan. And that has a lot to do with Japan’s relationship with China and the United States. LUCIA GREEN-WEISKEL: That’s right. Well, I think Japan has really shocked a lot of observers, because he — because Japan is really speaking out against the Kyoto Protocol. My understanding of this is that basically Japan feels an economic competitiveness with China. China is right on its borders. China is becoming an economic power in Asia. It is now becoming a political power and a model — an economic development model that many countries in Asia, and indeed around the world, are following. And Japan is threatened by that. And we’ve seen many signs — the issue over the rare earths minerals and also there’s been some territorial disputes in the seas in between Japan and China over resources and so on. The main issue here is basically that China is adamant about continuing the Kyoto Protocol. And the reason for that is because in the Kyoto Protocol is this one clause, common but differentiated responsibilities. And last year, when I was on your show after Copenhagen, I remember I said this was the main point, as well. So, this year China has taken a different negotiating tactic. They’ve been much more of the — a “yes” group. They’ve been saying yes to things. They’ve been very positive. They’ve been — Xie Zhenhua, who’s the main negotiator here, continues to say that China will play a constructive role in the negotiations. But this is really just a rearrangement or a different arrangement of their position last year, which is that they will not accept any agreement that doesn’t also — that doesn’t include the U.S., developed countries committing to binding targets. And that’s not happening, so China is also not committing to any agreement. But China is doing many things with our without an agreement. So this is something that many of the negotiators that I’ve spoken with and also a lot of the NGO leaders that I’ve spoken with have said — with or without an agreement, China will commit to these very ambitious targets. And indeed, as many people have talked about, through China’s targets of 40 to 45 percent reductions in energy intensity by 2020 of 2005 levels, China has set in motion subsidies and very aggressive government investment and central planning, including a cap-and-trade program. Now China is sort of catapulting ahead of the United States in many of these areas. Another big area is green technology. China is a leader in solar panels, in wind turbines and now electric vehicles, really the only country in the world that’s making these green technology at a scale that can drive down the price. You know, just in the same way that China drove down the price of things like T-shirts and our laptops and so on, China can also drive down the price of green technology. So those are some of the key points that China is — that the Chinese negotiators are putting forward. AMY GOODMAN: And it means? LUCIA GREEN-WEISKEL: Measuring, reporting and verification. And it’s actually the last part, the V, the verification part, that’s been so difficult for China, because the U.S. has said that the verification needs to be done with international inspectors. Now, in the last year, China learned a lot about what it means to calculate, to quantify your emissions, right? If you’re going to have an agreement that has any meaning, we need to make sure that a ton of CO2 in China is equal to a ton of CO2 in the United States. Otherwise, we’re comparing apples and oranges. So, China has learned a lot. I think the Chinese government has been briefed by very, very smart people, by scientists, and has learned a lot about what — measuring, reporting and verification of greenhouse gases. And they’ve realized, you know, this is actually — this is something we could do, no problem. We know how to do this. We have the engineers. We have the internal infrastructure to do this. And so, I think that’s been the big change. But the fundamental point that China upholds common but differentiated responsibilities is still there, and it’s still driving a wedge between the United States and China. AMY GOODMAN: Well, I want to thank you very much, Lucia Green-Weiskel, who works at the Beijing-based Innovation Center for Energy and Transportation, writes about China and the U.S. Her upcoming piece is appearing in The Nation magazine. This is Democracy Now! We’re broadcasting from Cancún, from the U.N. climate talks.